Impression lots subarea Nieuw Rhijngeest-Zuid Residential. Oegstgeest municipal council / Leiden University. 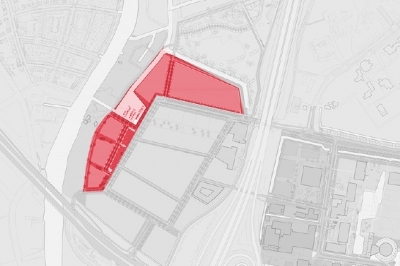 Two residential property sites are being provided in the Nieuw-Rhijngeest Zuid subarea: the strip to the north of Wassenaarseweg and the strip along the Rhine on the area’s west side. A new master plan is being prepared for this subarea. The master plans provide insight into such issues as the intended aesthetic quality of the area, densities per site, building heights and parking standards. Nevertheless, the provisions stipulated in the zoning plan will be normative. The business park is subject to urban planning supervision. A new zoning plan is being prepared for the subarea. Further information about the prevailing Zoning plan: click here. Further information about the Master plan from 2015: click here. Issuance of residential properties will be done by Leiden University on a freehold or leasehold basis. For further information see the page on issuance. The land prices are being determined. Parking standards in line with the municipal parking standards.